Among the rolling hills between Monmouth and Corvallis is an amazing hemp farm run by the Crawford brothers, Eric and Seth. It was our pleasure to meet them, and have them show us their impressive operation. I must say, their processes, strategy, and ethics blew us away. Believe me, you’re going to want to hear about it. 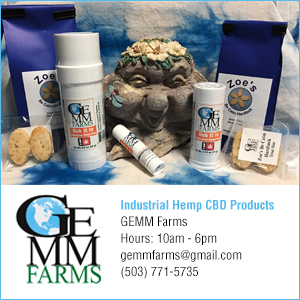 Oregon CBD’s breeding program produces varieties of feminized industrial hemp seeds. Industrial hemp is any cannabis plant that has a THC level of 0.3% or less in the flowering tops. At Oregon CBD, they’ve bred plants that produce very high ratios of CBD to THC, are structurally robust, have unmatched oil content and the earliest flower initiation possible in photoperiod-sensitive lines. Their feminized seed increases maximum per acre yields, minimize labor costs, and reduces the risk of cross-pollinating neighbors. This last process is vital because cannabis pollen can travel many miles unchecked; only using female plants for outdoor production prevents cross-pollination with recreational and medical cannabis growers. When we visited their greenhouses, they were pollinating the mother plants to produce seed. Yellow powdery pollen covered everything! The pollen is collected by hand, and each plant is hand pollinated by painting it on. This is a tedious process, but very productive, as it results in a lot of harvestable seed.